Selling products and services online isn’t always an easy business. Not to mention that client SEO can be an absolute headache. ‘Hey, Andrew – I want to rank for this and this in the next 2 months.’ In my head – well, that keyword has a keyword difficulty of 70 and your site has little to no domain authority, so 2 months is…ambitious. So you can either deal with merchandise yourself or you help clients sell their merchandise and deal with people that have often are stuck in their own understanding of SEO and bring their own expectations for when they should expect results (Its no wonder so many people end up promising the moon). That’s why many savvy marketers are looking for other ways to make income. Enter affiliate websites – the way to own your own SEO destiny without needing a product…or a client. Many SEO professionals and entrepreneurs end up creating their own websites for the passive income that comes from affiliate marketing. It has a huge appeal because it allows you to set up a website that doesn’t really need a product or service. When done correctly, affiliate marketing can be a profitable type of SEO marketing to break into, giving you a little extra cash flow or potentially becoming a full-time business. Although affiliate SEO is something that is easy once you’ve gotten the engine built, it still requires quite a bit of work at the front end – so be aware that affiliate SEO isn’t just magic money from a tree, and you can’t just enter any niche that you fancy. Affiliate marketing involves creating and optimizing a website to promote someone else’s goods and services, earning you a commission each time someone clicks your link and completes an action. Your income in affiliate marketing, then, comes not from selling your own goods and services; instead, you get paid to direct people to someone else’s website so they can sell the visitor their goods or services. A cookie is created that tracks the interactions of the searcher on the product site, and then you get a percentage of the sale from the customer’s purchase. An affiliate site operates much like any other site: You pick a specific niche, market to people interested in that niche, and convert those visitors into customers. Sign up for an affiliate network and decide what niche you want to promote. Choose the products and collect your affiliate links and place them on your websites, videos, or social networks so visitors see them, click, and continue to purchase a product or service. Wait for your target audience to perform the desired action and get paid. A desired action doesn’t necessarily mean the visitor makes a purchase. Your desired action could be a visitor signing up for a webinar, filling out a contact form, or downloading a lead generation asset. For a detailed list of affiliates, Empire Flippers makes a great guide. I’ll include the 10 options so you can explore it on your own. Looks like a relatively easy, pain-free way to make money, right? Now that you know how affiliate marketing works, it’s time to drill down into the individual tasks that make up a successful affiliate marketing campaign that will convert visitors into users who take the desired action, putting money into your pocket. Affiliate marketing is just like traditional online marketing; you have to choose a specific niche to target so you make sure all your efforts are laser-focused on finding the best, most qualified users who will convert with less effort. When choosing a niche, think about something you’re passionate about (if possible). If you choose a niche you have an interest in, especially when starting with affiliate marketing, it will make the process less frustrating and more fun. You’ll also be creating a lot of content and working deeply within your chosen niche, so selecting an industry you have an interest in and a passion for can decrease the amount of research and time it will take you to get your affiliate marketing site off the ground. Also, keep in mind that you want to choose a niche that has people looking for the goods and services you’re trying to promote. Choosing glow in the dark fidget spinners as your niche may be interesting to you, but if no one’s searching for or wanting to buy them, all your efforts will be wasted. Does the result say “Best ____” “Top 10 ____” type posts. Is there a review schema present? 1st: I want to know the bare minimum effort to get to page 1. 2nd: I want to know the full amount of effort needed to get to the top positions. The middle of the SERP is fine, but ultimately, my two goals are to get to page 1 and then to be in position 0-3. (speaking of 0 – featured snippets are also good signs for a niche). If you click page one – you can usually find something that says “affiliate” at the bottom. The last step to this would be to research the domain using Raven Tools domain research tool. The perk of Raven Tools is that you get Moz metrics and Majestic metrics side-by-side. Multiple data sources are always preferable when evaluating a site. When you’ve done this, move on to the next step. Once you have a niche, you need to choose a domain for your affiliate site. Do your best to choose a domain that includes some reference to your chosen niche, as this will make the connection clearer for searchers and will help improve your search engine visibility as you try to rank your website. Partial match domains and EMD domains still have power. Look at SEO + City and you’ll see what I mean. Your next step – and the task that will determine the rest of your efforts on your affiliate marketing site – is to choose the right SEO keywords you plan to target with your site. It may seem natural to use and focus on only the shortest keywords, such as “wedding florist” from the example above, but that could prove to be an uphill battle. Short-tail keywords such as “wedding florist” do have higher search volume, but they also have much higher competition.. Choosing a mixture of short-tail keywords and long-tail keywords such as “peach-colored summer bridal bouquet” or “low-cost wedding florist” will give you the most interested, ready-to-convert visitors and produce more results. Start by listing the short-tail keywords that seem most relevant for your business, then use SEO research software such as Raven Tools to gather more ideas and support your focus keywords with data. Entering your short-tail keywords will populate a list of related long-tail keywords, many of which you can use for individual content pieces targeting the most engaged visitors to give you the highest chance of converting them. 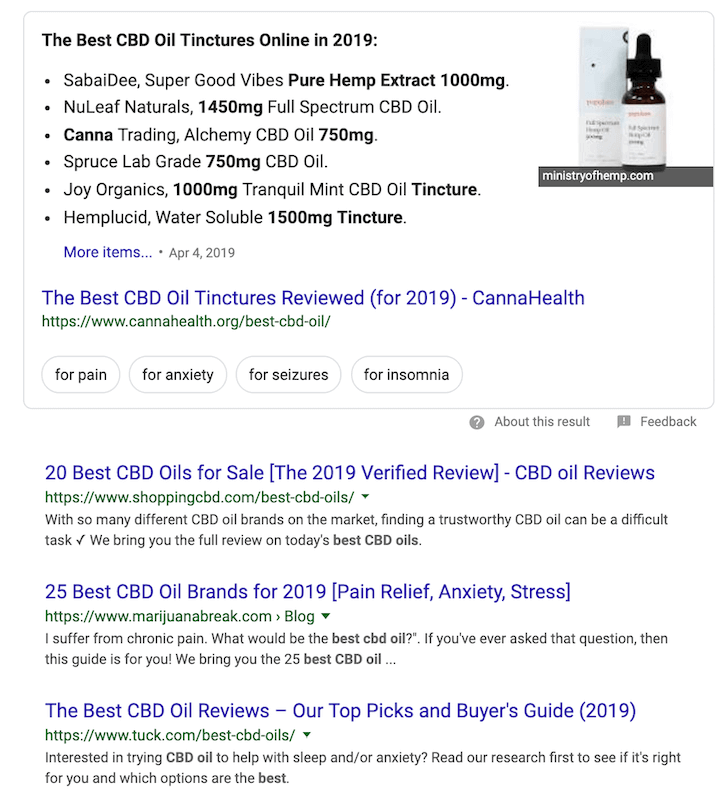 Lets take a look at the top results for the keyword we are testing out – Best CBD Oil. Top spot looks pretty intimidating, but it’s feasible to get in the top 3. Before you can begin collecting money, you need to have products or services to promote. Finding affiliate partners can take a variety of forms, and depends greatly on what niche you’re in. If you’re looking to promote physical products, a large web-based store such as Amazon is a good place to start. You also can search for “chosen niche + affiliate network” to see if there are any specialized programs to join. Once you join an affiliate program, you will get special tracking links you can use on your website. If your website’s visitors follow the link and make a purchase, you receive a commission. Some industries, especially service industries, won’t have affiliate networks. In these cases, you will have to approach businesses on your own and propose an affiliate program. For funneling traffic to these websites, you receive a commission on any sales made. Many business owners will be happy to entertain an affiliate program because your website can provide more customers for them, increasing their business. Just be sure that, whatever route you choose, traffic from your website is trackable when people land on your affiliates’ websites so you can receive your commission. Now that you’ve decided on your list of keywords to target, you need to get those keywords onto the pages of your website with some engaging, click-worthy content. Don’t just create any content for the sake of creating content. Be intentional and careful about the content you choose, and make sure it’s written for the people who will read your website and not solely for search engines. Sure, you want to build in those important keywords you researched and selected, but your copy needs to meet the needs of your readers or it won’t make you money. Content is the main way you build your authority and create trust with your audience. To get buy-in on the affiliate links found on your site, you need your audience to trust that you know what you’re talking about and that your recommendations won’t lead them astray. Great, well-written content that answers questions your visitors have or offers solutions to their problems can bring you tons of reliable traffic over the life cycle of your affiliate site and can drive those visitors toward the desired actions that give you your payday. Interested in a full rundown of SEO Techniques? Read up on our 12k mega guide as you build your affiliate site. Remember those long-tail keywords? Find ways to build rich, well-written, focused blog posts around each one of them. You’ve got your keywords figured out and you’re working on adding exceptional content that converts to your site. Now, you need to make sure all the on-page elements are working for you to get you seen by searchers. If your website is slow, visitors aren’t going to wait around to see what you have to offer. 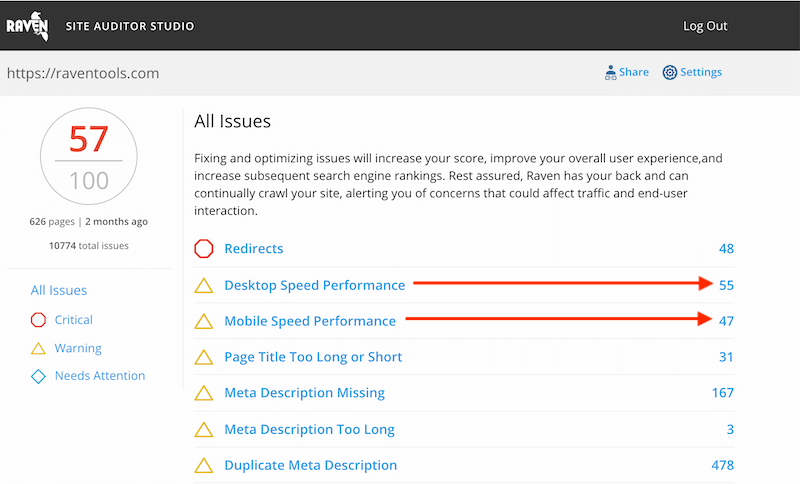 Check the load speed of your pages and, if things are too slow, see how you can decrease file sizes or change the scripting so you improve the experience for the user. The URLs of your individual pages should be structured logically and your website organized in a way that makes sense to the user. If your URLs don’t include a logical structure, such as “/blog/post-name-1” instead of “/1243234,” your users may begin to distrust your website and, in turn, leave without taking action. Take some time to create your website’s hierarchy so related topics fall under one another and, as you create new pages, be sure that you’re including keywords in each URL instead of the URLs defaulting to strings of random numbers. While URLs may not make a direct impact on your affiliate site’s SEO, they do play into user experience, which is an indirect ranking signal for the search engines. Your pages’ meta descriptions – the paragraphs that show up under the page title in the search engine results pages (SERPs) – are one of the first things searchers will see about your website. Make sure each page has a unique meta description that includes the focus keyword, and use your 160 characters to craft something that entices the reader to click. Images increase engagement and keep people on the page longer, so be sure you’ve got several relevant, high-quality images sprinkled throughout your website. But don’t just leave the images hanging there on their own; add image alt text to help more searchers find your site. The alt text on images should include one of your keywords that most closely relates to the image. This step is important because the alt image text is what triggers Google Image searches, so properly labeling your images can only improve search visibility and bring in more traffic. People’s online activity is moving quickly away from laptops and desktops toward mobile. If your website doesn’t look good and isn’t easily navigable from mobile devices, you’ll lose large portions of visitors. Additionally, Google’s mobile-first indexing push means that websites without mobile versions are de-prioritized in the SERPs, causing rankings to slip and traffic to dip. If you’re looking for a tool to help you with this process, any website audit tool will do, but we’ve tried to create a tool that allows for teams to work together and we try to incorporate task management inside of the tool. This way, you can track what’s fixed and what still needs work. Ideally, you would do everything right without needing an audit tool to tell you where you’ve messed up, but just like a writer needs an editor, an SEO needs something to check their work. Ask any group of SEO professionals about the importance of backlinks to SEO and you’ll get answers that will fall into two different camps: Backlinks are essential for ranking well or a website’s backlink profile doesn’t matter for SEO. No matter your opinion, building some backlinks for your affiliate marketing site can only help your website, especially as you work to build credibility and authority. Niche Edits (when you edit an existing page/post and insert a new link. When search engines see that your website got a link from another website, especially one that is highly respected and trusted in your industry, they give your website’s authority a little bump. Collecting several of these little boosts gives your site an edge over a similar website in your niche, giving you better visibility. Off-page analysis is also something you should be aware of as you look into backlink acquisition for your target posts. Let’s continue with the CBD example from earlier. If you look at the top results – backlinks don’t seem to be a huge issue. So now that we know this – we can move on. Social media is an important part of everyday life for many people, and brands are utilizing the platforms more and more to reach out to and engage with potential customers. While you don’t have to throw yourself full-bore into an extensive social media calendar, especially at first, you need to at least create and optimize profiles on relevant social media platforms. At a minimum, all SEO affiliate websites should have Facebook and Twitter profiles. If you chose a niche that sells physical products or is highly visual, such as hair styling or photography, creating an Instagram profile can reap rewards. For less visual verticals, such as attorneys or other professional services, LinkedIn may be a better choice. When you create a profile, make sure all your profile and cover photos are high-quality and represent your business, and that any contact information is the same on all platforms. Once you’ve got the profiles created, begin sharing the blog posts you create on your website. Using these free tools to amplify your content creation efforts gives you more opportunity for people to see your content and click through to your website, leading for a higher probability that the desired action will be taken and you’ll make some extra money. If you’re feeling really spicy, you can invest in a full-on social media strategy, but I won’t dig into that here. All your hard work on the other eight steps of this guide will be for naught if you skip this final, important step: Creating and optimizing the spots on your website where you want visitors to take an action that converts them from readers to users. Make sure that you’ve got strong, focused calls-to-action on all the crucial points on your website so that your visitors know exactly what action you want them to take at any given moment. Spend some serious time, and maybe a little money, crafting the best calls-to-action you can find for your website. Without these focal points, you won’t funnel your visitors in your desired direction and all your work will be wasted. All the traffic in the world means nothing if people aren’t converting and taking the actions you want them to take. While SEO affiliate marketing may seem the easy way out – After all, you just create a website and watch the cash roll in, right? – it takes some serious skill and hard work to create a high-converting, profitable affiliate site. But if you put in the work and keep your potential visitors in mind at every step, you can create a valuable affiliate site that could provide some nice secondary income.